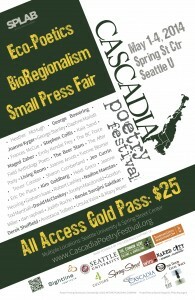 The Cascadia Poetry Festival is an international event which seeks to bioregionally animate & culturally construct Cascadia by gathering writers, artists, scientists and activists to collaborate, discover and foster deeper connection between all inhabitants and the place itself. Over four days the fest features Academic, Democratic and Performance components, late night readings, a Small Press Fair and one workshop. Some of the best poetry minds in the bioregion, many Canadians not well known in the U.S., gather, discuss this place and begin to better understand Cascadia and our role here. The festival was founded by SPLAB, a Seattle-based non-profit organization founded in 1993 and the first iteration happened in 2012. Cascadia III will happen in Nanaimo, BC, in 2015.